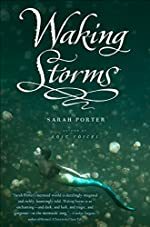 Waking Storms by Sarah Porter. Book Two of the Lost Voices Trilogy. Luce now lives alone in the ocean after she leaves the troubled tribe, but she is needed back again. Luce should be the mermaid queen. The cruel queen Anais has stolen the throne and now wants Luce dead, even though she realizes the power of Luce's voice that can do something only few mermaids have accomplished. Luce has other problems too. Dorian is the boy that has caused Luce to break the mermaid law to rescue him. He wants her to pay for having accidently drowned his family. But while the mermaids still think that humans don't suspect they're there, the FBI just so happens to have several mermaid actions recorded. Luce and Dorian soon fall in love which is against mermaid law. But when Luce meets Nausicaa, she begins to think there might actually be hope for mermaids and humans. Is there any way for Luce to take back the mermaid throne without putting her love with Dorian in danger and getting caged up by the FBI? Waking Storms is one of the best books I have ever read. It is a modern version of Romeo and Juliet, but with a touch of fantasy added to the story. I seriously couldn't predict what was going to happen next because the whole problem in the story kept changing and becoming more and more enchanting. 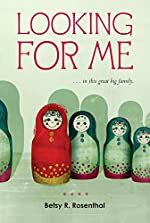 I thought that Sarah Porter made Luce different than any human, but added just the right touches so readers could still be able to relate to her. Each character was well thought out and different from the next. Dorian is reckless but really is kind at heart. Nausicaa is wise but understands exactly how Luce feels. Luce is just a girl, despite being a mermaid. She is still just a girl at heart. The book is super amazing and is as unforgettable and as life-changing as the mermaid's song. Review written by Abigail (7th grade student). We would like to thank Houghton Mifflin Harcourt Children's Book Group for providing a copy of Waking Storms for this review. Have you read Waking Storms? How would you rate it? Star Time by Patricia Feilly Giff. A Zigzag Kids Book. 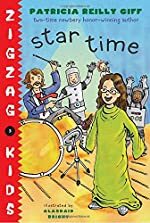 Review: Star Time is the fourth book of the Zigzag Kids series. It teaches a couple of valuable lesson through the main character Gina, about treating people the way you want to be treated, and to never give up. Written by Patricia Reilly Giff, it is a book appropriate for younger children eight and younger. It is a nice fast read and will certainly bring a smile to your face. When Gina finds out that there is going to be a play at the Zigzag Afternoon Center, she plans on being the star and tells everyone about it. A former famous actress is coming to the center and Gina plans on impressing her. However, things go terribly wrong and Gina misses meeting the actress and talking to her. Gina finds out that other girls want to be the star too, including Destiny Washington, who is the prettiest and most perfect girl at the Zigzag Afternoon Center. With music teacher Mr. Sarsaparilla’s assistance, Gina is able to find the perfect role in the play and everyone is happy including her. Star Time is a quick and enjoyable read that taught me a few things. I like how it flows and it is easy to understand. I would give it five stars for the intended audience - younger children. They would love this book because they can relate to it. I especially recommend it to kids who need to learn lessons about treating people fairly and the importance of never giving up. All in all, Star Time is a wonderful, speedy read that is intended for a younger age appropriate audience. The lessons it teaches are most valuable. I think this book should win an award because it can change the way a person thinks and acts, due to the lessons it teaches. We would like to thank Random House for providing a copy of Star Time for this review. Have you read Star Time? How would you rate it? 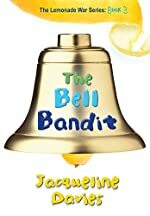 The Bell Bandit by Jacqueline Davies. A Lemonade War Series Novel. Review: Has something terrible ever happened to your family, and you're just aren't ready for it? Well, get ready for it in The Bell Bandit, written by Jacqueline Davis. It is the third book in The Lemonade War Series. The series' characters' are a friendly duo, Jessie and Evan Treski. The Bell Bandit is about Evan and Jessie's stay at their grandmother's house after a huge disaster happens. But that is not the only problem to worry about; the huge bell on Lovell's hill has gone missing! This worries Jessie, but Evan does not believe her. They have always rung the bell on New Year's, and if they don't this time, it will not be the same! But eventually, Jessie meets a boy named Maxwell who knows her grandma very well. Jessie wants to crack this case, so when she has enough ideas, she teams up with Maxwell to find the bell. Meanwhile, Evan is helping a repairman named Pete fix Grandma's things after they see her damaged and charred house. But it isn't over yet! When Grandma comes back from the hospital, she seems to have lost her memory! So a typical time at grandma's house becomes a catastrophic time. So Evan and Jessie have to make things right. But, as Jessie goes on a mission to find the bell and Evan puts up with the fact that his own Grandmother has forgotten about him, they surprisingly have a fun time. I enjoyed The Bell Bandit very much. There is nothing in this book that I disliked. The part that I enjoyed the most is when the Sinclair brothers are torturing a frog, while intending to kill it. Everyone freaks out, especially Maxwell, and there is a big fight. But the idea that meant the most to me is the fact that no matter what trials they go through, Jessie and Evan take them well. They maul their way through every problem, no matter what it is. This teaches people of today to never give up, because you will later be proud of what you did. This book is very elaborately written, that I wish I had read the previous books in The Lemonade War Series. All in all, The Bell Bandit deserves 5 out of 5 stars. If you like books that have mysteries, entertainment, and heartfelt meanings, then this is the book for you. Review written by Anjan (7th grade student). We would like to thank Houghton Mifflin Harcourt for providing a copy of The Bell Bandit for this review. Have you read The Bell Bandit? How would you rate it? Island of Thieves by Josh Lacey. Review: Thieves, guns, and more! Island of Thieves by Josh Lacy is an awesome book that will hook you to the very last page. "Only boring people get bored…Interesting people can always find something to be interested in," according to Josh's father in Island of Thieves. This mantra leads to Josh accidentally burning down his parents' shed - after all, he was bored! Afterwards, his parents decide to take a vacation, and the only willing family member to watch Josh is his Uncle Harvey's who is a little different. Uncle Harvey embarks on a treasure hunt in Peru in order to pay back a Peruvian slum lord the money he owes him. As there is potential for danger, he refuses let Josh come. However, Josh soon enough persuades him to let him join him on a quest filled with danger, mystery, intrigue, and life lessons. If you want to find out what happens to Uncle Harvey and Josh, read Island of Thieves. 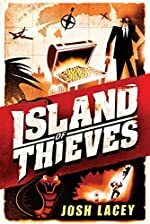 Island of Thieves deserves 4.5 stars out of 5 stars. The book for the most part stays on track but will sometimes drift off topic. This was not a significant issue, but is worth mentioning. Also Island of Thieves has an autobiography on John Drake in the back for historical references throughout the book. As far as action goes, Island of Thieves has high octane action throughout the whole story. This is a very action packed book. The characters are not that easily relatable because they sometimes have moments where readers would really question the character's actions. However, readers can easily visualize the setting with the incredible details provided by the author. Island of Thieves is a great book to read on lazy days, days at the beach, and on long car trips. Island of Thieves is an awesome book and deserves 4.5 out of 5 stars. Buy Island of Thieves now! We would like to thank Houghton Mifflin Harcourt for providing a copy of Island of Thieves for this review. Have you read Island of Thieves? How would you rate it? Flirting in Italian by Lauren Henderson. The first book in the Flirting in Italian series. Review: What's better than flirting and Italy? Well, just put the two together and you get Flirting in Italian, the first book in a three book series by Lauren Henderson which is even more superior. Lauren Henderson has also written the Scarlett Wakefield series among several other books as well as Jane Austen's Guide to Dating which has been suggested to be made into a film. The second book in the series is going to be Kissing in Italian. The main characters are Violet, Kelly, Paige, Kendra, Elisa, Luca, and Catia. I really loved Lauren Henderson's Flirting in Italian! It was phenomenal! I would say that this book has a genre of mystery/romance. At times it creates suspense with romance at the same time. I suggest this novel for young adults who love mysteries but a little on the soft side with a hint of romance. One of the times it creates suspense is when it says "'But Kelly's right,' I think, wincing. 'From now on, maybe I should stay away from the Castello di Vesperi….'" Like I said, this mystery is awesome! I hope you love it just as much as I do! I can't wait for her to publish her next book in the series, Kissing in Italian! Review written by Andrea (8th grade student). We would like to thank Random House for providing a copy of Flirting in Italian for this review. Have you read Flirting in Italian? How would you rate it? My Mixed-Up Berry Blue Summer by Jennifer Gennari. Review: 'Take Back Vermont!' Seeing signs just like this all over town is very scary, especially when they're about you - and against you. It's kind of hard having two moms, especially after no one in your town is used to the new law allowing it. In the story My Mixed-Up Berry Blue Summer by Jennifer Gennari, June Farrell has to put up with this torture daily. June Farrell is not an average 12 year old girl. For example, June's mom isn't your regular everyday mom. June's mom - also known as MJ - is different than most moms because she is of a different gender. This makes everyone else in their town angry because there has been a civil union law passed recently that allows people of the same gender to get married. No one in town likes this law or this idea. Therefore, they try to make people who have chosen an alternate lifestyle feel bad. This is a real problem for June and her family because her mom and her girlfriend are planning on getting married soon. Because of this, June is losing friends whose parents are against this law. All this pressure is really bothering June so, when she has the opportunity, she loves hanging out with her friend Luke and going swimming in Lake Champlain. One thing that June really looks forward to all summer is the fair. This year is the first year that she can enter in the pie competition with her award winning pies. However, June's mom wants here to lay low for a while because of everything else that is going on. Therefore, she will not let June enter in the fair, bringing more disappointment for June. 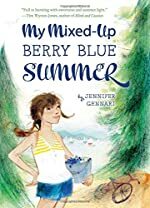 My Mixed-Up Berry Blue Summer by Jennifer Gennari is a very meaningful story. The struggles that June face are not unique struggles. As more people are becoming more open about their alternate lifestyle, children of these homes are bound to face adversity. It doesn't have to even be homosexual parents though. The kind of adversity that June faces could be a result of any number of reasons, making My Mixed-Up Berry Blue Summer meaningful for all readers. However, I feel that this book is meant for more mature readers due to its age restricted material. That is why I feel that this book would be great for children ages 12 and up. My rating for My Mixed-Up Berry Blue Summer would be a 5 out of 5 rating. I feel that this story is very thorough and is told from the heart. It takes a great author to create a masterpiece like this! We would like to thank Houghton Mifflin Harcourt for providing a copy of My Mixed-Up Berry Blue Summer for this review. Have you read My Mixed-Up Berry Blue Summer? How would you rate it? Pilgrims Don't Wear Pink by Stephanie Kate Strohm. Review: Who likes history as much as Libby Kelting? Who knows? Libby Kelting is the main character of Pilgrims Don't Wear Pink written by Stephanie Kate Strohm. For Libby Kelting the best summer before senior year is working as a counselor at Camden Harbor where it is always 1791 (the year it was built). Libby loves history and historical romance novels. Libby has a very annoying roommate named Garrett. Garrett is a video-gaming loving, Star Trek loving geek. He is also a rookie newspaper reporter on the case of a ghost drowned sea captain. What or who is the ghost? Is Camden Harbor really haunted? "Throw in a summer fling with Cam, the hottest sailor in the harbor" but who may not be quite as he seems, and you have a very confusing summer for Libby. This is for the most part a good book. I rate this book 4 stars. The beginning is confusing. I had to read it twice to really understand what was going on. Other than that, it is a good book. Overall, Pilgrims Don't Wear Pink is best for readers who enjoy a little mystery combined with romance. At the beginning I was not very interested, but it definitely gets better throughout the book. Stephanie Kate Strohm is an amazing author, and I encourage everyone to read her book. We would like to thank Houghton Mifflin Harcourt for providing a copy of Pilgrims Don't Wear Pink for this review. 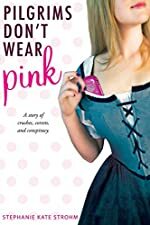 Have you read Pilgrims Don't Wear Pink? How would you rate it? Deadly Pink by Vivian Vande Velde. Review: Reality or Suicide? Deadly Pink by Vivian Vande Velde is a mystical, fantasizing, and suspenseful novel that is a must read! Deadly Pink is the third book in the series about the virtual reality games of the Rasmussem Corporation. The first two books are User Unfriendly, Heir Apparent. The main characters in this book are Grace Pizzelli, Emily Pizzelli, their mother, and Mrs. Bennett. Grace Pizzelli never likes being called down to the principal's office, even if it's because her sister is trapped in a Rasmussem virtual reality game and won't come out. When she finds out she is the one who can bring Emily back to the real world, Grace soon changes her mind. As she enters the Land of the Golden Butterflies, the doubts begin… Why would Emily choose to put herself in such "little girl" game? Why don't the boys in the game talk at all…? How did I ever agree to do this since I am just an average person? But then she finds out the answers to everything. Emily is changing the Land of the Golden Butterflies with the sprites' magic. So now this game could not only cost Emily her life, but it could cost both sisters their lives. They must repay… … … Will the sisters ever be able to live in the real world, or will they suffer virtual suicide…? I really enjoyed reading Deadly Pink because the game made me imagine being in it for real! I would suggest this suspenseful book to young adults who enjoy anticipation while reading novels. In Deadly Pink it set off real suspense when it said "Emily might die, for real…" You never know what will happen so it forces your brain to keep on reading! Like I said, this book was amazing! 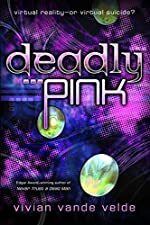 One great aspect of Deadly Pink is that it is not critical to read every book in the series. Although I had not read either of the two books before reading Deadly Pink, I still was engrossed! I totally suggest Vivian Vande Velde to write more books - adding on to her series. I really hope you love Deadly Pink as much as I did! Now I'm going to the store to buy another book written by Vivian Vande Velde! We would like to thank Houghton Mifflin Harcourt for providing a copy of Deadly Pink for this review. Have you read Deadly Pink? How would you rate it? Graffiti Moon by Cath Crowley. Review: Most times when I looked over he wasn't drawing. He was leaning back in his chair and staring at me. And every time he stared I felt like I'd touched my tongue to the tip of a battery. I was nothing but a tingle. After a while the tingle turned to electricity, and when he asked me out my whole body amped to a level where technically I should have been dead. I was pretty sure we had nothing in common, but a girl doesn't think straight when she's that close to electrocution. So begins Lucy's unconventional relationship with Ed. 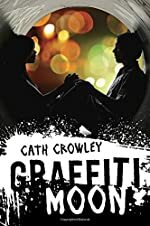 Told through the voices of three Australian teens, Lucy, Ed, and Poet, Cath Crowley's novel, Graffiti Moon, tells a story of adventure, poetry, and life never being quite what it seems. Lucy, an art student who has just finished her senior year, is a seeker of adventure. After breaking Ed's nose on their first date, she starts out on a quest - a quest to find Shadow. Gifted with raw talent, Shadow spends his nights painting amazing and symbolic pictures on the sides of buildings. He is the ultimate graffiti artist, and Lucy can see through his art and knows he is her soul mate. Ed, on the other hand, has dropped out of school to find some way to help his single mother support them. Finding a job and a male mentor at a local art store fills a void in his life - that is until his boss loses his life. After having his nose broken, Ed steers clear of Lucy and instead dedicates his nights to releasing his innermost thoughts in his artwork. However, once he hears of Lucy's desire to meet Shadow, Ed tells her that he knows where to find him, and as a result, Ed takes her on the adventure of a lifetime in an all-night search for the man of her dreams. Poet, is a complicated person who best expresses himself through poetry. In one assignment he composes the following poem titled "Where I lived Before." In his poem he writes, "I used to live with my parents, In a house that smelled like cigarettes, And tasted like beer if you touched anything, The kitchen table was a bitter ocean, That came off my fingers, There were three doors between the fighting and me, And at night I closed them all, I'd lie in bed and block out the sounds." As Ed's best friend, Poet is at his side and has an adventure of his own on that awe-inspiring night when Ed takes Lucy to meet Shadow. Graffiti Moon is an artsy novel that takes readers through the lives of three seemingly different people who find ultimately that in fact, they are very much alike. The design of the novel, the portrayal of the events from three completely different perspectives is intriguing. It adds an interesting insight into each character that would never happen if the story had simply been told through the perspective of one of the characters. Plus, the complex lives of the characters - each having his or her own demons to hide - creates a realism that will draw readers into the plot. One of the most fascinating parts of the novel is reading Poet's work. Each chapter told from Poet's perspective is told, not surprisingly, through poetry. The level of symbolism and rhetorical devices used in his poetry could definitely be missed by the casual reader. But great insight can be found if the reader looks a little deeper. Overall, Graffiti Moon, is an enjoyable adventure where people come to the realization that whatever is missing in their lives can be found closer than it at first might seem. We would like to thank Random House for providing a copy of Graffiti Moon for this review. Have you read Graffiti Moon? How would you rate it? Someone Else's Life by Katie Dale. Review: A seventeen-year-old should be in the prime of her life, anxiously awaiting all the adventures of adulthood. But that is not the case for Rosie. Her mother has recently died from complications related Huntington's disease. As she faces the reality that she too has a 50% chance of being struck by Huntington's disease, she is struck with a seemingly more traumatizing reality. When she finally decides to undergo testing to determine if she indeed has the genetic abnormality that rears its ugly head in adulthood, her mother's closest friend confides a secret that has plagued her since the day Rosie was born. She was switched at birth. 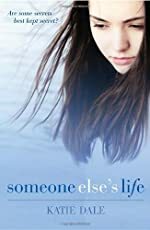 Someone Else's Life by Katie Dale is a thrilling tale of a girl and her ex-boyfriend leaving England and heading to America on a quest to find her "real" mother. "A person cannot exist without a past. Someone famous said that. But what if your entire existence is a lie? It's like I've been wearing stilettos all my life, leaving footprints everywhere I go, and then one day someone says, 'Hey! Those shoes don't belong to you!' and they take them away. And I look back, and all I have left are the old footprints, which don't even fit my feet anymore, so I can't go back, but I haven't got any new shoes to go forward in, so I'm stuck. Frozen in this place. Not even existing." This is how Rosie views her destiny. As she tries to fill in the gaps in her life, her ex-boyfriend invites her to tour America with him. She agrees unbeknownst to him because she has found the true identity of her mother - a Hollywood star. However, once they hit the States, nothing goes as planned. The secrets that plague her life are far deeper than she'd ever expected, and soon she is tangled in a web of deceit that only she can untangle. Someone Else's Life is a heart wrenching tale of love, lies, and a roller-coaster ride readers won't quickly forget. From the first page through to the end, Katie Dale keeps readers on the edge of their seats in Someone Else's Life. Not only is the exposure of such a frightening, yet less widely known disease gripping, but the information shared regarding Huntinton's disease is thorough and valuable to readers. In addition, the character development is superbly crafted. It's nearly impossible to watch Rosie travel on her quest for knowledge without noticing the growth she makes as a person. She leaves England a child, but leaves America an adult. Although at times the character's reactions to the situation seem overly dramatic, it only helps in reinforcing the severity of the issues faced when being swapped at birth. The reader, knowing the background for the decision to swap the babies is faced with a moral dilemma that cuts at the core of everything known to be right. Katie Dale has hit on a fabulous young adult novel that will keep readers thinking after the last page. We would like to thank Random House for providing a copy of Someone Else's Life for this review. Have you read Someone Else's Life? How would you rate it? Abraham Lincoln by Mary Pope Osborne. A Magic Tree House Fact Tracker Book. Review: Have you ever heard of Honest Abe, the man who never told a lie? Well, his life had included so many great experiences that a Magic Tree House Fact Tracker book has been written entirely about him. Abraham Lincoln Fact Tracker Book by Mary Pope Osborne and Natalie Pope Boyce is about Abraham Lincoln, the famous, long bearded 16th president who never told a lie. Lincoln was a great president because of everything he did in his life. This fact tracker includes many aspects about his life and most of them are less-known facts you don't hear in school. I think this book is an awesome biography about Abraham Lincoln with some pictures and captions. This was yet another great Magic Tree House Book. 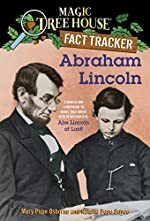 At the beginning of this Abraham Lincoln Fact Tracker Book, readers learn about Abraham's childhood. He was born on February 12, 1809 in a one room log cabin at Sinking Spring Farms by the Nolin River. Through his childhood, he grew up in a poor family and poor life. Every day he would wake up early and work for his family in the fields. In the winters, he would have to build a log cabin for his family and cut trees and build it himself. In the spring and summer, he worried a disease that traveled through milk. As he got older, he had earned a job as a mail carrier and became an avid reader. While reading about Lincoln's life, readers will learn how he eventually gets the nickname, "Honest Abe", and they will read about interesting anecdotes from his life. The book takes readers all the way to the White House and then the unfortunate day when John Wilkes Booth assassinated Lincoln. Abraham Lincoln Fact Tracker Book gives valuable information about Abraham Lincoln and his life. It is an excellent resource book for younger readers and goes along nicely with another Magic Tree House Book. Mary Pope Osborne wanted to write books for her kids. Her kids loved her books she then wanted to publish her book and write more for the world! In all of her books, she uses her main characters, Jack and Annie, who use their tree house, which is magical and explore the world, going on educational adventures along the way. But this book is a fact tracker, full of facts, on people and places, such as Abraham Lincoln! I think these books are great and everyone should read them. They are filled with adventure and action and facts. My sister read these books, every, single, one, and she said she loved these books! I read these books while I was younger and I thought these were awesome. This fact tracker about Abraham Lincoln is filled with informational facts perfect for a school report or just for fun. I give Abraham Lincoln Fact Tracker Book 5 out of 5 stars for its awesome characters, side facts and even the fact it is on Abraham Lincoln. We would like to thank Random House for providing a copy of Abraham Lincoln for this review. Have you read Abraham Lincoln? How would you rate it? Mister Death's Blue-Eyed Girls by Mary Downing Hahn. Review: How would you feel if two of your best friends were murdered and the killer was never brought to justice? One day Nora and her best friend lose two of their very close friends. Nora, Ellie, Cheryl and Bobbi Jo go to a party the day before the last day of school and plan to meet the next day at school. Ellie and Nora get to school and look for Cheryl and Bobbi Jo but they can't find them anywhere. After school, Cheryl and Bobbi Jo are still no were to be found. While Ellie and Nora head home to get ready for a picnic that the girls had planned for after school, they hear police sirens and rush outside. Then reality strikes home….the reason Cheryl and Bobbi Jo never showed up at school was because earlier that morning the girls were murdered. Nora spends a lot of her summer crying and feeling sorry for herself, and Nora spends her days trying to get over the fact that the two of her best friends have been killed. 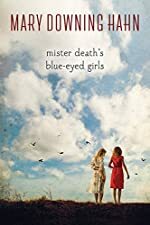 Mister Death's Blue-Eyed Girls is a story of hardship, friendship, and growing up that can be enjoyed buy all readers. Mister Death's Blue-Eyed Girls was an amazing read, I enjoyed it so much. This story was such an action packed story that always kept me at the edge of my seat. The characters were all based on real people and this book was written about a true event which made the book even better. I enjoyed knowing that this was real but at the same time it was unbelievable because who knew that could happen in real life? All of the characters grew somehow for example everyone became stronger knowing that something's can't be undone This book was such a great read that I will surely read it over and over again for years to come. I rate Mister Death's Blue-Eyed Girls a ten out of ten, because it was a great read. The characters were amazingly well detailed so they felt like they could be my friend which was amazing. This book is truly a one of a kind because it's special and is a fun read for anyone that's going to pick this book up. I enjoyed how the book was told from different sides, for example Nora, Ellie, Charlie, Mister Death, Mister Death's brother all told a couple of chapters in the story which made the book come to life. I really enjoy this book because it's like nothing I've ever read before which is great because if something is out of your comfort zone it might actually be good, just try it out. That is why I rate this book a ten out of ten. We would like to thank Houghton Mifflin Harcourt for providing a copy of Mister Death's Blue-Eyed Girls for this review. Have you read Mister Death's Blue-Eyed Girls? How would you rate it? Wuftoom by Mary G. Thompson. Review: An out-of-this world book would be fantastic to read. That's why I recommend reading Wuftoom by Mary G. Thompson. Although this is a one-time book meaning it's not part of a series and the author isn't an award winner- yet this book is winner worthwhile, stand-alone novel that is deserving of many awards! 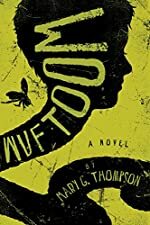 Mary G. Thompson wrote her heart out in this exceptional book about an ordinary boy who turns into an extraordinary species known as "Wuftoom". Wuftoom are worm-like creatures, some with human heads that remember nothing after their full transformation including their own name. The main characters the story is based upon are a boy named Evan and his over-worked mother. The whole reason that Evan is transforming is because of his excited imagination and his eagerness to investigate a field, but he accidentally steps in pink goo that starts to transform him into a Wuftoom. In the book, there is an entire chapter on the Wuftoom and how Evan starts to transform. Evan's overworked mother, though, isn't afraid of Evan and visits him, knowing that he won't be staying for much longer. However, there is one "thing" as Evan calls it, which wants him to become a Wuftoom. One reason that the "thing" wants Evan to transform is because the "thing" is Evan's future kin, Wuftoom. Excited his "proem" (prodigy or really, larva) is transforming, Evan is visited by that Wuftoom frequently as Evan transforms into a Wuftoom. If another person were in Evan's position, they'd want to reverse the transformation, which is exactly what Evan tries to do, but accidently starts a war with blackmailing the Vitflys who are the sworn enemy of the Wuftoom. Accidently, Evan endangers himself, his kin, his only family, and the Vitflys as well, soon after fully transforming into a Wuftoom. However, two people know that Evan is a Wuftoom, his mother and his kin, one of which wants to help Evan escape the Wuftoom and to be free. Will Evan help save his kin and his mother? Wuftoom is a book that is heart-warming even though it contains conflict with family and a war combining to create a one of a kind story about an ordinary boy turning into an out of the ordinary mutant worm. The way Mary G. Thompson created these out-of-the-ordinary characters and developed a mixed theme between conflict and love really completed this one of a kind book having great explanation of each character in the fullest detail about every little part about each event, character, theme, lesson, etc. making the book pull together around a mixed theme showed throughout the entire novel. Reading this book will create a love for reading in everyone, including the ones who don't read because of how they believe books seem like, lifting anyone into a mood to read their mind to pieces that the books the read are so intriguing and mind-blowing creating a little world of imagining what books really can do to you. Enjoying this novel wouldn't be a surprise to anyone who knows this book because they have read it and absolutely enjoyed the whole entire book, making them want to read as much as they can by Mary G. Thompson and then any other book. Wuftoom is an award-worthy book that I give 5 out of 5 stars for all of the action like when the Vitflys and the Wuftoom wage war on each other that was combing with love and mutant tribes, making it one of the, interesting, intriguing, odd yet terrific best books I've ever read ever. I highly recommend this exceptional novel for anyone intrigued by a fictional love and war novel of any kind to read this book and enjoy it to the fullest extent! We would like to thank Houghton Mifflin Harcourt for providing a copy of Wuftoom for this review. Have you read Wuftoom? How would you rate it?